When Obama left office, ISIS was damn near a third political party. That moron funded their terror effort against Americans, as he tucked tail and ran from Iraq. In our hasty departure, America left billions of dollars in military equipment and a nice money stash. Obama reduced the war effort to droning; the American people and occasionally ISIS. Obama promoted the JV team to varsity, and ISIS was large and in charge. So much so, that the Obama administration told us ISIS had sophisticated internet recruiting tools. ISIS had a propaganda arm, and hired young men to recruit impressionable teen boys and girls. Hell, ISIS even published a magazine! What next? An awards show?! Donald Trump said he would “bomb the sh*t out of ’em”. Then, he promised to drive ISIS from the face of the earth. The announcement came on Saturday. Just three days before the Alabama special election that transfixed the nation, and on the same day that President Trump fact-checked the Washington Post’s Dave Weigel, Iraq’s prime minister declared victory in the war against ISIS. Iraq — with indispensable American help — has regained control of its cities and its border with Syria. ISIS has been reduced to a shadow of its former self. The victory isn’t confined to Iraq. American-allied forces control ISIS’s former capital in Syria, and the world’s largest jihadist army is gone. Bands of insurgents still prowl the countryside, and ISIS cells exist across the world, but the war against the “caliphate” is over. It’s been won. So why does no one seem to care? It was exactly three years ago that the Middle East was in crisis. The ISIS blitzkrieg had brought Iraq to its knees. Jihadists controlled immense sections of Iraq and Syria. Abu Bakr al-Baghdadi spoke from Mosul’s Great Mosque, declared himself “Caliph Ibrahim,” and called on Muslims across the world to join him in his jihad. Yet, ISIS hasn’t grown, and in fact has shrunk. We reported recently on this fact. “For approximately three weeks, the coalition launched 52 airstrikes to help shape the battlefield and force ISIS into a position from which they would fall. The importance of this tactical move is epic, as ISIS relinquished the territory. They’ve been downgraded to a terrorist insurgency. Their eventual defeat is all but guaranteed. Obama’s military plan allowed the Taliban to gain more territory. This is because Obama prohibited our military from getting in front of the problem. “Obama only allowed U.S. troops to respond to the Taliban in a defensive, reactive kind of manner, rather than offensively — ordering them to wait for a situation to develop rather than getting in front of it. During the Era of Obama, the rules of engagement essentially made eunuchs of the military. But president Trump changed the rules. 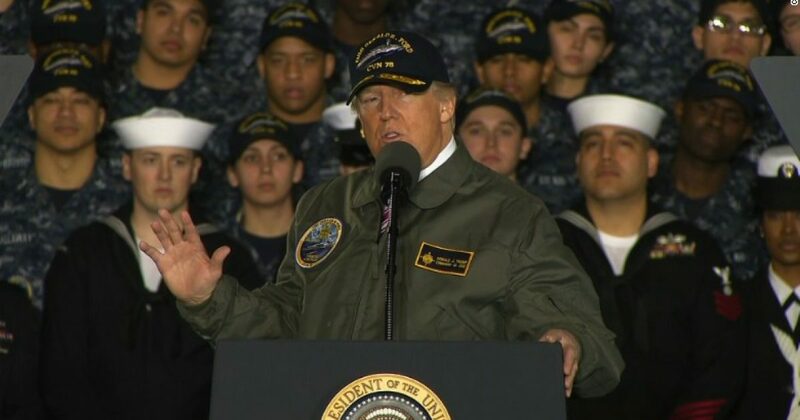 America’s new Commander in Chief brought common sense to the military. Now, they actually get to confront and engage the enemy. “Secretary of Defense James Mattis has changed the rules of engagement in Afghanistan, in effect unleashing troops to fire on the Taliban without first having to be in physical contact. Mattis said Tuesday at hearings before the House and Senate that the White House had given him new authority to change the rules of engagement, which he has already made use of by letting U.S. troops fire on the Taliban regardless of physical proximity, Military Times reports. Such a change is not entirely unexpected, as President Donald Trump said in an Aug. 21 speech that he would “expand authorities” for U.S. troops in the region, though at the time he didn’t elaborate on what precisely that would look like. “We will also expand authorities for American armed forces to target the terrorists and criminal networks that sow violence and chaos throughout Afghanistan,” Trump said during a speech. Uncanny how America wins when we’re allowed to fight. Yet again, President Trump cleans up Obama’s mess. And yet again the media ignores the real story.